A few days ago my grandson had his ninth birthday. He had previously made a long list of things he would like for his birthday. This sure helps old grandfathers like me in the selection process. I am usually quite hopeless in choosing appropriate gifts for family members. One of the items on his list included books in the Tiny Timmy series written by Australian soccer star, Tim Cahill and co-written by Julain Gray. My grandson only had Book 1 in a six-book series. I read this book and I was very impressed. It has been many years since I read mostly children’s books. That was when I was a teacher/librarian and a classroom teacher in primary schools. The book I read this last week was Tiny Timmy: Soccer Superstar. Being the first in the series, the protagonist Tim is mad keen on becoming a soccer star. He desperately wants to play on the school soccer team. There are just three main problems: he is smaller than his teammates, he is constantly teased by the other players, and the coach doesn’t pick him in the team. Tim is not discouraged, though even his attempts at being the team’s orange boy are disastrous. Although the authors don’t use the word perseverance, this book shows young, enthusiastic soccer players that hard work, dedication and trying hard to improve will pay off. Little Timmy keeps practising and helping out until he discovers that he has a unique skill the other players do not possess. I loved this book. It is easy to read. It encourages young people to keep trying. It teaches children to stay focused on what they want to achieve. It is easy to read with appropriate illustrations on every page. The chapters are short and filled with action. I cannot find any information regarding how biographical these books are, and they are listed by the publisher as fiction. It doesn’t matter; they are great little books for anyone aspiring to improve in any endeavour, sporting or otherwise. I highly recommend this book for readers ages 8 to 10, especially if they are keen to improve in any sport, not just soccer. I was so impressed with the first book in the series that I went and bought books 2 and 3 for my grandson. I think he was impressed. Cahill, Tim and Gray, Julian: Tiny Timmy: Soccer Superstar. Scholastic Australia, Sydney, 2015. I have been having a trip down memory lane in recent days. I have been typing up an old story I wrote many years ago. In fact, the only copy I appear to have is a typed copy with 1989 on the title page. I was shocked to realise that this story was written nearly 28 years ago. It has languished ever since as one or two copies stored in boxes in our garage. The copy I am using was printed on an old dot-matrix printer. Remember those old clunkers? 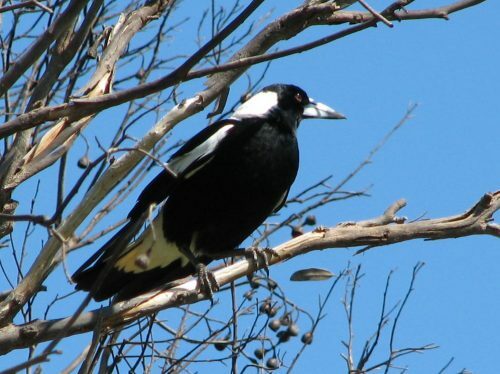 This story, called Magpie Farm (hence the photo of an Australian Magpies above and below), was typed on either a borrowed Commodore 64 computer or on the Amigo 500 I bought around that time. I can’t remember. I think that it was written during a school holiday break; I was a classroom teacher at the time. Those old computers were wonderful, and I learned so many things about the digital world from them. I still have the old Amiga – in working condition too, though I only fire it up every five years or so. Sadly, the old Amiga discs are not compatible with today’s PCs, hence the need to retype this story. I am sure that this was my first attempt at writing a novel for children. At just under 10,000 words it is probably better described as a chapter book. I have since written several more novels for children, of varying lengths and subject matter. I am planning to prepare these for publication sometime this year. They will initially be in eBook format with print on demand paper copies also available. As I type up this story, I recognise many incidents from real life. The main character is a young boy who is afraid of magpies. 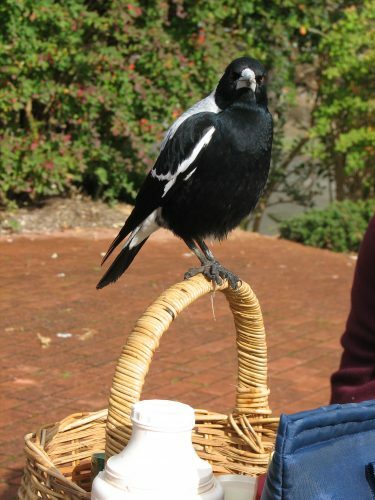 Some Australian Magpies are notorious for their tendency to swoop people during the breeding season. 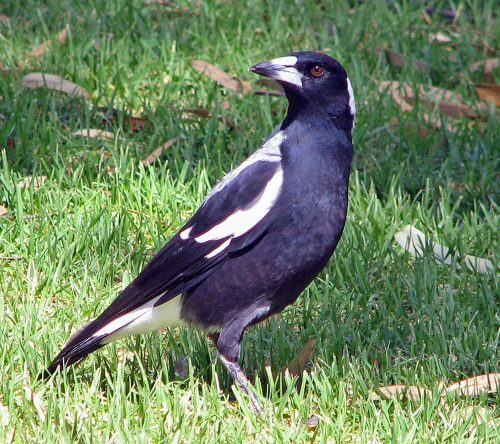 The boy’s family move to a small farm and he is horrified that there are magpies on the farm. Some of the incidents I have included in the story are drawn directly from my own family’s experiences. A few years before writing this story, we also bought some acreage, though five acres (two hectares) can hardly be called a “farm”. We did have some sheep for a while; I’m not sure if that qualifies it as being a farm. I have a serious problem with the story. Several problems, actually. Honestly – it needs some serious editing, rewriting and restructuring. The problem is that I have decided to be very strong as I type it up. I tend to edit as I type. This applies to most of my writing these days. The first draft is often very close to the final draft. I rewrite, edit, proofread and so on as I go. Not always, but usually that is my preferred writing style. This time I decided to be very strong and resist all urges to stop and rewrite, edit or change anything. Those steps will come later. I have certainly progressed a long, long way as a writer in the intervening years. There is much good material in the story which can be vastly improved. I now know what is wrong with the story and the writing, and how to fix it; that comes with experience and heaps of writing practice (over 3 million words later, and counting). I still have a few chapters to type up. Then I will spend a week or two rewriting whole slabs of the text to bring it up to publishable standards. Later will come the proofreading and copy editing stages before I send my baby out into the world. After that, I have two other longer novels written several years later and they will both need the same treatment. If the story as it stands now is so terrible in my own eyes, is it worth pursuing and putting in all that work? I believe so. I take this attitude, not because it was my first serious attempt at a novel, but because of feedback from readers. At the time I printed out a number of copies and handed them out to friends. They all commented how good it was, and how much they enjoyed it. I also read it to several classes I was teaching at the time of writing. I still have contact with many former students who remember the story well. I was asked recently by one former student if I had published this story. He added that it had a profound, positive effect on him. It inspired him to become a writer. He has published some of his writing, he has participated successfully in performance poetry events, and he wrote and performed in a musical which was showcased last week at the Adelaide Fringe Festival. This festival is regarded worldwide as second only to the Edinburgh Fringe Festival. Wow! I love feedback like that. I plan to publish this chapter book (novel?) in the near future, so stay tuned. The launch will be announced on this site, and it will be available through this site. Trevor’s Birding – check out another blog of mine where I also write regularly about Australian birds. I showcase many of my bird photos on that site. Hawke, Rosanne, 2015, The Truth About Peacock Blue, Allen & Unwin, Crows Nest. This latest novel for young people written by South Australian author Rosanne Hawke is compelling reading. It is one of those stories you can’t put down, but you know that to go on reading will be confronting, challenging, and even infuriating. I say ‘infuriating’ because many readers will want to jump into the story personally and put right some terrible injustices. 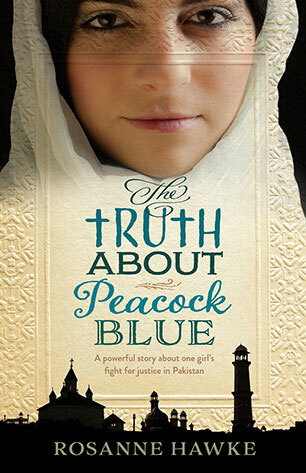 The caption under the title on the cover encapsulates the story so well: A powerful story about one girl’s fight for justice in Pakistan. This story deals with real issues in the real world in the lives of real people today. While it is fiction Hawke has been inspired by the true story of Pakistani woman Asia Bibi who has been accused of blasphemy. She has been in prison for five years and remains there as I write this. I read this novel shortly after finishing the autobiography of I Am Malala – you can read my review here. That was confronting enough, but on the very next morning after reading Hawke’s novel our guest speaker at our church was Bishop Patrick Sookhdeo, founder of the Barnabas Fund. He spoke graphically of the growing crisis in Syria and surrounding countries, as well as issues in Pakistan and elsewhere. The brother of the protagonist Aster dies due to an illness. She is then thrust into the limelight as the hope of the family. She is enrolled in the high school where her brother was to attend. She is at first excited and keenly looking forward to the opportunity of an education, something denied many girls in Pakistan. Life quickly turns sour for Aster in her new school. Being a Christian in a predominantly Muslim community has many challenges for her. When one of her teachers takes a strong dislike to her, life becomes very challenging and potentially dangerous. In the midst of the anxiety of exams, Aster is suddenly arrested in front of her fellow students because of something she wrote in her paper. She is accused of blasphemy, a serious crime which leads to the death penalty in Pakistan. The remainder of the story documents the struggle Aster has to come to terms with life in prison. The conditions are confronting to readers like myself: atrocious, inhumane and downright filthy, not to mention dangerous. Her trial is rescheduled a number of times and her challenges mount daily. Throughout all of this she never loses her faith which shines through the darkness and evil all around. I had to personally face the question: ‘How would I react and cope if faced with similar persecution?’ In my sheltered life here in Australia I have never been confronted by such issues. Aster’s Australian cousin Maryam takes up the challenge of helping her. She starts an online campaign in the form of a blog and a worldwide petition on behalf of Aster. Hawke has cleverly used fictional quotes from the blog to debate some of the issues surrounding this terrible law of blasphemy. Similar real-life, heart-wrenching campaigns are becoming far too common place today. Once again Rosanne Hawke has written an emotive, fast moving and insightful novel. The reader gets an in-depth view of life in a repressed country with all the cultural, social and religious nuances at play in the lives of her characters. By the end of the book the reader has a strong sense of the utter hopelessness of her fellow prisoners but also of Aster’s hope under-girded by her strong Christian faith. I am currently visiting my grandchildren who live interstate. It’s a joy I have only a few times every year, but so interesting to see their development and to play with them a whole range of games. Their ages are 4 and 1, so they are still developing in many ways, especially in their imaginations. One of the special delights is cuddling up for story time. Both parents are book lovers, so their home has many books. Family and friends have also made sure the two little ones have plenty of books in their lives. And to add to the wonderful books in the home, a new branch library has just recently opened up in an old church building five minutes’ walk up the road. In reading books daily to the grandchildren – and sometimes several times a day – once again has impressed upon me the importance of reading in the life of a child. So much language development occurs in this pre-school period. So many books are rich in wonderful language. But more than that, there is so much cultural heritage which can be absorbed by the young, developing mind. There are also the many environmental concepts which can also be introduced through non fiction. Last night my grandson and I spent nearly an hour pouring over a book about farming; he lives in Australia”s largest city so this is an excellent way of talking about my heritage; I grew up on a farm. The case for reading to and with children is so important and soundly supported by the research. What is less emphasised, I feel, is the importance of reading children’s books if one desires to be writing children’s books. Just like in the importance of books in the life of a developing child, so is the reading of children’s books vital in the development of the aspiring children’s authors. You cannot read too many, and there are so many wonderful children’s books out there now you will certainly be entertained for many years to come. Cover of "Taj and the great camel trek"
Rosanne Hawke: Taj and the great camel trek. Published in 2011 by University of Queensland Press. 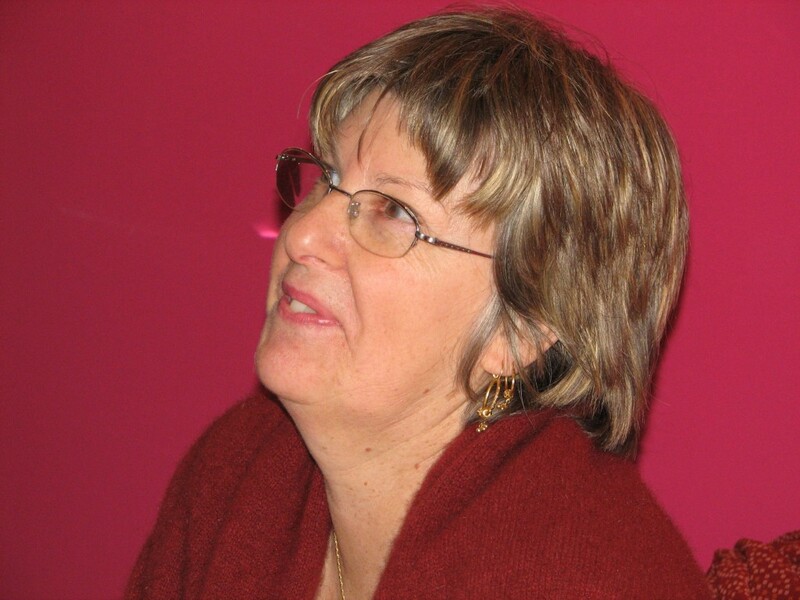 Two weeks ago I was privileged to attend the Adelaide launch of Rosanne Hawke’s latest novel. I am becoming addicted to launches of her books; this is the fourth one I’ve attended in three years. As anticipated it was a joyous time of celebration because I know how hard she has struggled with this story over the last 4 years. The main character, twelve year old Taj, lived in Beltana in outback South Australia in the 1870s. His father is a cameleer and Taj has his own camel Mustara, a character in its own right. In fact, Taj and Mustara have featured in another Hawke book, the picture book Mustara. Taj and Mustara are invited to join explorer Ernest Giles on his second expedition across Australia from Beltana to Port Augusta and then on to Perth in Western Australia. It is not a journey to be undertaken lightly because much of the territory they planned to cover is desert, for most part uninhabited even by local Aboriginal people. The team accompanying Giles struggle with coming to terms with the isolation, their own feelings of fear, the harsh environmental conditions and the almost total lack of water. At times, they traversed many hundreds of miles without finding a drop of water. The whole journey has them on the very edge of disaster throughout, giving the reader a sense of the extreme hardships they endured. While this is a novel, written as fiction and from Taj’s point of view, many of the incidents and characters are based on real events and real people taken from Giles’ own journal and the records in newspapers of the day. Taj himself is a fictitious character which points to the real strength of this book. Rosanne revealed at the launch that this book was originally conceived as non-fiction, but early on in her research and early drafts discovered that fiction was a far more powerful vehicle to tell the story. In this way the author has brought history to life for the reader, a delicate balancing act at the best of times. She has handled the transition with great skill. We see and feel the anxiety of the party through the eyes and emotions of Taj. Taj and the great camel trek special page – including photos from the launch and teachers’ notes. Merchandise – buy T-shirts, mugs, ties, fridge magnets and many other items featuring the cover art work from the book. I am the proud owner of a Taj coffee mug which I use every day. Marrying Ameera – my review of Rosanne’s previous best selling novel, listed recently as a Notable Book. You are currently browsing the archives for the Young Readers category.